From bioluminescent corals to deep-vent worms, from tropical underwater volcanoes to the Arctic Ocean floor, we know less about the landscape of our ocean than we do about the moon's. Bring the excitement of current ocean science discoveries to your students using this Ocean Exploration curriculum and a CD-ROM of the Ocean Explorer Web site from the National Oceanic and Atmospheric Administration (NOAA). Bring the excitement of current ocean science discoveries to your students using this new Ocean Exploration curriculum. Learning Ocean Science through Ocean Exploration is a curriculum for teachers of Grades 6-12 that takes lesson plans that were developed for NOAA Voyages of Discovery and the Ocean Explorer Web Site and presents them in a comprehensive scope and sequence through subject area categories that cut across individual expeditions. Each lesson focuses on an inquiry-based approach to teaching and learning and is correlated to the National Science Education Standards. The curriculum themes are arranged in an order that progresses from physical science through earth science to biological and environmental science, as ocean sciences include all of these areas. Curriculum themes are based on 1) the geologic formations that cut across expeditions (seamounts, ridges and banks, canyons and shelves, and mid-ocean spreading ridges), 2) using models to understand structures and functions, and 3) using scientific data in the classroom to model scientific work and thinking. 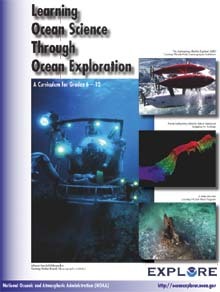 What is unique in this approach is the combination of the Ocean Explorer Web Site with each lesson presented here. Through this approach, teachers and students have a direct connection to the scientists whose work they are modeling in the classroom and a direct connection to the exciting new discoveries through NOAA ocean exploration. Look for upcoming professional development opportunities in the use of Learning Ocean Science through Ocean Exploration. Color copy of the curriculum cover. Introduction and guide to the use of these materials, the Ocean Explorer Web site and CD and opportunities for teachers and students to become involved in ocean exploration. A brief discussion of the history of ocean exploration and technological advances in modern times. An introduction to modern ocean mapping and the reasons it is critical to ocean exploration expeditions. This video provides an opportunity to see this lesson implemented in a high school classroom: http://www.coexploration.org/ostv/lesson1.html . Understanding currents around underwater geologic features is essential to the safe conduct of ocean exploration expeditions. Currents also affect sediment distribution and character as well as the distribution and abundance of organisms around a feature. Ocean explorations focus on unique geologic ocean features. This section discusses their formation and function. Their location, characteristics and origins are included. While most ocean explorations focus on the deep-sea floor and its benthic ecosystems, there are also scientists on board many expeditions who are interested in the organisms that live in open waterboth pelagic swimmers and plankton. This section examines the physical factors that distinguish vertical zones in the ocean. This video provides an opportunity to see this lesson implemented in the classroom: http://www.coexploration.org/ostv/lesson2.html . The creation of life-sustaining carbon compounds from inorganic components is the basis of life on Earth. The primary production of biological molecules is largely accomplished by photosynthesis, but chemosynthetic bacteria sustain several unique ocean ecosystems. These bacteria use energy from inorganic chemical metabolism to power the production of organic molecules as sources of energy and food. Only a few unique species are the focus of this section. They were chosen because they are novel and strange. Deep vent tubeworms were totally unknown before 1977. This section also considers the unique natural chemical properties of some species that may make them a source of useful human products in the future. Each ocean exploration expedition asks questions about the composition and structure of deep-sea communities. These communities change over time. Deciding how to sample them in the limited time available is a challenge for ocean scientists. The scientists are seeking to describe the distribution and abundance of deep-sea crea-tures around the geologic features studied. While ocean exploration is about looking forward, many expeditions included some aspect of potential or past human impacts on the ecosystems studied. Here are two.